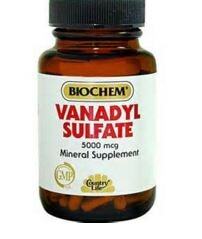 1 What is Vanadyl Sulfate? 2.1 How do Vanadyl Sulfate works? 3 What is the desired dose and adverse effects? Vanadyl Sulfate is an inorganic common compound of Vanadium; a low concentration of Vanadium is in our system that can be found in food like eggs, milk, mushroom, cereals and seafoods. Vanadyl Sulfate supplement is believed to play a big role in glucose metabolism and a compound that helps bone and teeth build up. According to research studies, Vanadyl sulfate supplement was developed to imitate the effect of insulin in our system. This is an immense miracle for diabetic clients. How do Vanadyl Sulfate works? Researchers explain that Vanadyl sulfate supplement acts like an insulin. Since it imitates insulin, we should know first the following, in order for us to understand fully the drug mechanism of Vanadyl Sulfate; What is insulin and how does it work on our system? How does an Insulin metabolism work? Insulin is a hormone produced by our pancreas; it works as a transporter of glucose and other minerals into the cell. Therefore, it controls the level of glucose in the blood by regulating the glucose production. Metabolism process starts when we take in food, enzymes breaks it down to a smaller form called glucose; this are absorbed easily in the intestine. Glucose is a simple sugar that serves as a food or energy of a cell. It has a bigger structure compared to other compounds, so that it can’t get inside another cell. Insulin plays an important role making glucose bind with the outer membrane of the cell making it more permeable; glucose and other minerals can then get in easily into the cell. This process lowers the amount of glucose found in the bloodstream and other mineral-like amino acid can get into cell. These amino acids serve as a building block of growth since it construct and do repair inside the cell. Therefore the more insulin is in our body; the lesser glucose is in the bloodstream, making your blood less viscous thus preventing hypertension. There is also a study that Vanadyl Sulfate reacts on LDL cholesterol, also called as bad cholesterol. It lowers down LDL cholesterol by inhibiting the enzyme in the liver that controls the cholesterol production; therefore, reducing bad cholesterol and triglyceride levels in the bloodstream, decreasing the fats building up in the arteries that could block and lead to cardiac arrest or cardiac stroke. Vanadyl Sulfate supplement is very beneficial to diabetic clients as this will prevent them from the occurrence of deadly cardiovascular diseases. What is the desired dose and adverse effects? Study shows that Vanadyl Sulfate is safe when taken in 75, 150 and even 300 mg per day in long term use but, with exception to clients who are hypersensitive and with kidney or liver failure. It shows that researchers have accomplished an alternative medical management for Diabetes Mellitus. They were able to discover and develop vanadium in a supplement form of Vanadyl Sulfate as an effective supplement that has multi-benefits; such as helping build up bone and teeth; mimicking insulin, therefore reducing the glucose level in the blood stream and lesser viscosity of blood; it lowers blood pressure, preventing the occurrence of hypertension. The effect to lower LDL cholesterol, also known as bad cholesterol; decreases the risk among diabetic clients in having a cardiovascular disease which is its common complication. On the other hand, there are still pros and cons on taking Vanadyl Sulfate supplement so better yet to, read more articles about it or do more research and before taking this supplement, never forget to first consult your physician, safety and choice in taking the supplement varies on your unique medical case or it depends on the discussion with your physician. For those clients who are taking the supplement in long term, it’s a good advice to gradually stop because minerals are more probable to cause toxicity compared to that of vitamins.